Pakistan cricket board are set to announce Azher Ali as new Pakistan ODI captain for the upcoming series against Bangladesh starting from 17th April 2015. Misbah-ul-Haq and Shahid Afridi played their last odi game against Australia in the world cup quarter finals and their departure had left PCB with a headache of selecting a suitable ODI side and more importantly a new captain and PCB went out of the box and appointed brand new name as the ODI captain in Azhar Ali while Sarfraz Ahmad will be his deputy. Misbah and Afridi will continue to captain in Test and T20 international games respectively but Azher Ali is set to be new captain for ODI while PCB will also announce vice captain who will be Sarfraz Ahmad. The decision of Azhar Ali to be named new captain will surely raise some eye-brows because he was not part of the World Cup squad and has not played a single One Day International in the last 2 years. 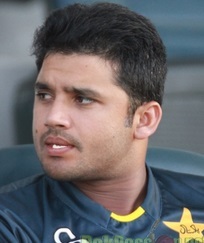 Azhar has played 14 ODI so far in his career last of which came back in September 2013. Update: PCB has actually confirmed Azhar Ali’s appointment as the captain for ODI team which will be touring Bangladesh in April. While Sarfraz Ahman will be his vice captain. Azhar Ali will also deputy Misbah-ul-Haq as the Test captain. PCB has announced all three squads for the test, One day and T20 to be played in Bangladesh in the middle of April below is the official list of players who will be playing in each format.